I had a chance to review the Moodster Mirror, and it's cute. It helps kids practice facial expressions and associate them with emotions, teaching them not only what they might look like, but also how to recognize emotions in others. Little kids often don't have good ways to practice learning about emotions, and parents don't often have the necessary tools to help them. These products, which also include a Feelings Flashlight and Moodster Meter, come with books that help kids use the tools to learn about, measure, and express their own emotions. Now available at Target stores nationwide and on Target.com, each toy + story book set retails at $19.99! 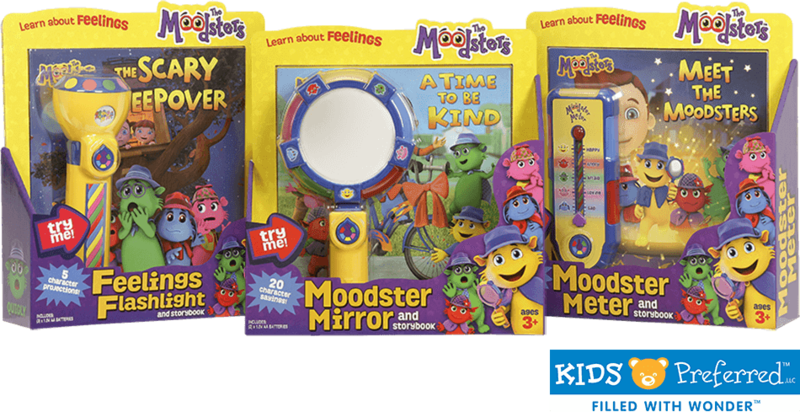 Moodster Mirror™- an electronic mirror with character voices to help kids recognize their feelings and non-verbal cues, which is a key EQ skill. “A Time to Be Kind” storybook. Zach and his best friend, Sam, love to ride their bikes together. But when something terrible happens to Sam’s bike, Zach has a tough decision to make. With a little help from The Moodsters, Zach, learns how kindness can make things right in this heartwarming story that explores the true meaning of friendship.